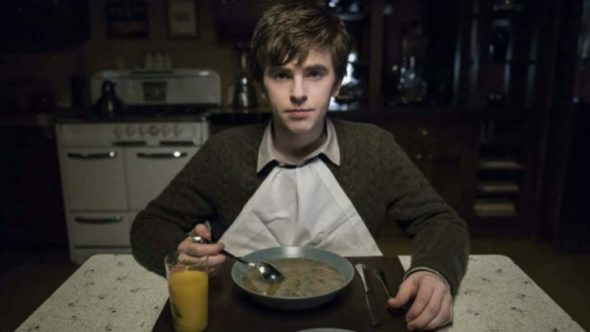 The fifth and final season of Bates Motel just premiered on February 20th, but is now the right time to end the A&E Psycho prequel series? The drama stars Freddie Highmore as Norman Bates, the troubled son of Norma Bates (Vera Farmiga). The cast also includes Max Thieriot, Nestor Carbonell, Olivia Cooke, Kenny Johnson, Nicola Peltz, Michael Vartan, Kathleen Robertson, Michael O’Neill, Paloma Kwiatkowski, Rebecca Creskoff, Michael Eklund, and Mike Vogel. However, she also mentioned she would “never say never” to a sequel series. So why end the A&E show now? Looking at the ratings, Bates Motel have been fairly consistent over the past few seasons. Season four received an average rating of 0.55 in the 18-49 demo and a total of 1.45 million viewers. For comparison, season three earned an average rating of 0.73 in the 18-49 demo and 1.80 million viewers. What do you think? Is now the right time to end Bates Motel? Would you be open to a sequel? Please make a sequel to Bates Motel. Love watching this show. Please create a sequel. Love the show. Watch it with my wife. Hate to see it end. I absoulutely loved this series. It had just the right amount of scariness to keep me interested. loved the show. hate to see it end. be open to a sequel as long as the quality of the episodes remain. loved the actors. Very good show. I would support a sequel. PHENOMENAL STORYTELLING, FANTASTIC CAST, EXCITING, CREEPY AND ENTERTAINING . MY FRIENDS AND I CAN’T BELIEVE ONE OF THE BEST SHOWS ON TV IS COMING TO AN END IN TWO EPISODES. I COMMEND THE GREAT WRITERS, CAST AND A&E WHO BROUGHT THE BATES MOTEL TO LIFE.